The Catawba Rosenwald School was built in 1924-25 to serve the African American community in southeastern York County. 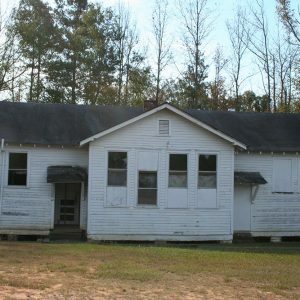 It was known as the Catawba School on official lists of Rosenwald schools, but is generally known as the Liberty Hill School locally because of its association with Liberty Hill Missionary Baptist Church nearby. It was one of 20 schools built in York County with funds from the Rosenwald program between 1917 and 1932. Of these schools, only two, the Catawba Rosenwald School and the Carroll Rosenwald School, are known to be extant. The Catawba School is built according to Rosenwald Plan #20 as a two-teacher rural school.